The Hero Haulin' Battle Bike! When the forces of good and fair play threaten to take over the world, who will dare stand in the way of all that disgusting righteousness? Supermutant Bebop, that's who. He's an anti-hero who's not a. . .
From out of the sky comes a new breed of ultra hero. He's taller, stronger, faster... and green. It's Supermutant Leonardo. He's joined up with his Supermutant brothers, Supermutant Leonardo, Supermut. . .
From out of the sky comes a new breed of ultra hero. He's taller, stronger, faster... and green. It's Supermutant Leonardo. He's joined up with his Supermutant brothers, Supermutant Donatello, Supermu. . .
From out of the sky comes a new breed of ultra hero. He's taller, stronger, faster... and green. It's Supermutant Michaelangelo. He's joined up with his Supermutant brothers, Supermutant Donatello, Su. . .
From out of the sky comes a new brand of ultra hero. Taller, stronger, faster... and green. 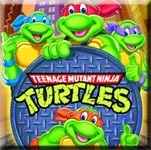 Supermutant Splinter, Supermutant Donatello, Supermutant Leonardo, Supermutant Michaelangelo and Supermutant. 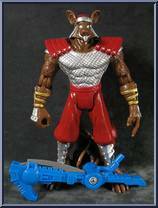 . .
Supermutant Shredder is in control of the most powerful super force on the planet. He commands the likes of Supermutant Bebop and Supermutant Rocksteady - and, by hook or by crook, they do his bidding. . .